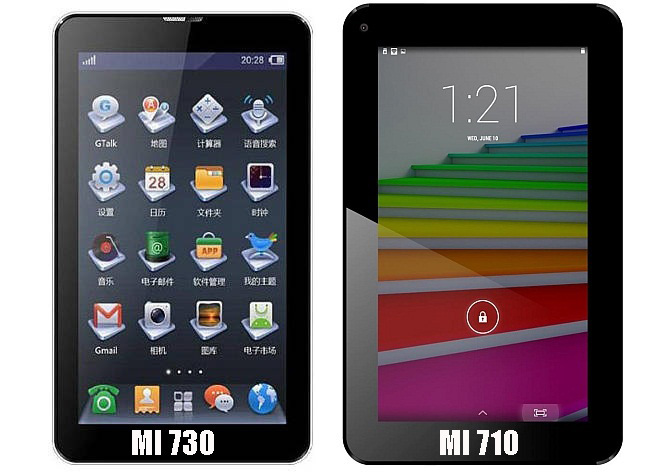 Spice has launched two new low cost tablets dubbed Mi-710 and Mi-730. Both the tablet has been listed on Homeshop and can be purchased at Rs. 3,999 and Rs. 4,999 respectively. Both tablets feature 7-inch HD display with pixel resolution of 1024 * 600 and running Android Kitkat OS v4.4. Tablet packs 512 MB RAM and 4 GB as internal storage which can be expanded via. microSD card upto 32 GB. Tablet PC has been backed by 2800 mAh battery. Mi-710 has 2 MP cameras at Back & 1.3 MP cameras at front and has been powered by Quadcore processor clocked at 1.3 GHz. It is available only in black color. Mi-730 has dual Sim slots with 3G supports and supports voice calling. It front camera is of 0.3 MP and 2 MP camera at back and has been powered by Dualcore processor clocked at 1.3 GHz. It is available in white color variant. Connectivity includes Wi-Fi, USB with OTG and Bluetooth. Both the tablet is perfect substitute to Videocon VA81M Voice Calling tablet and comes with price tag of Rs. 4900. Tablet bears same configuration as in Mi-730 only the difference is in battery i.e. VA81M has been backed by 3000 mAh battery which is rated to deliver 96 hours of 3G calling support and 96 hours in standby mode and can be purchased from Flipkart.